Indoor plants that are in full flower in January include the strongly coloured Primula Obconica shown above. They look good in traditional blues, pinks and white with the new Twilly series including a strong red. There are plenty of long lasting blooms particularly if you pick off dead flowers. The hairs on the back of leaves can be an irritant so take care if you have sensitive skin, the plant is also known as Poison Primrose. Plants at garden centers may have been grown specifically for a quick show of colour that makes them saleable and decorative as indoor plants. They are probably not frost free or very hardy. 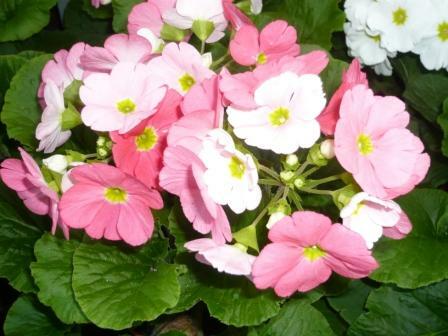 Unlike other Primula obconica varieties, Twilly Touch Me is primine free, so causes no skin irritation. Grown from seed give them dark to germinate. 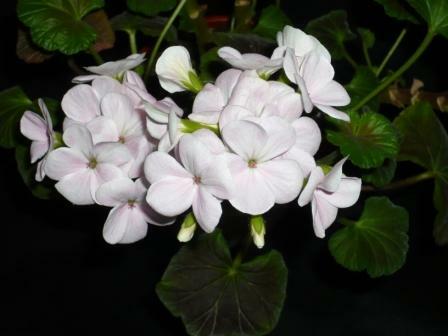 They flower the following spring/summer in the cool greenhouse or as a houseplant. Primula obconica produce a dozen different colours of flowers. The flowers last for several weeks if spent flowers are deadheaded regularly. Do not let the plants dry out and the leaves become floppy. 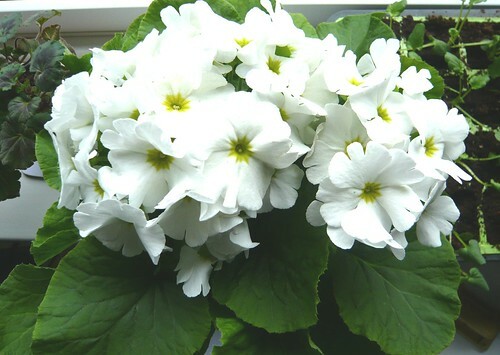 Showing the soft fleshy leaves of ‘Twill Touch Me Series’ of Indoor Primula obconica. 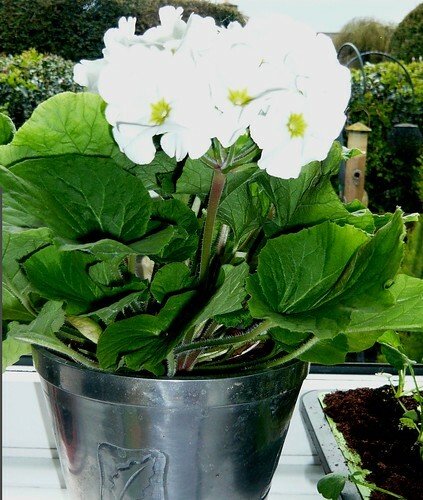 The Primula stem holds the flowers proud of the leaves. 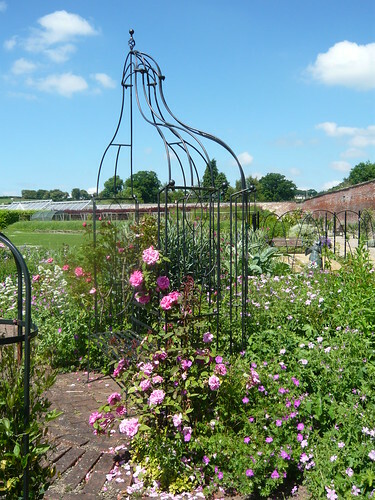 Indoor flowering all year round can be organised with the right pelargoniums. Throughout January this Pelargonium has been in constant pink flower on my desk. Each of 14 pips or mini buds opens to a 5 petal flower in a bunch of florets to make up the overall flower head. Three or four are in colour at any one time. I left the plant too cold and dry and some leaves went a dark red but normally the leaves are a clear green. Some pelargonium leaves, called zonals, are banded and have good colour schemes. Betty Shellard for example has tri-coloured golden leaves. 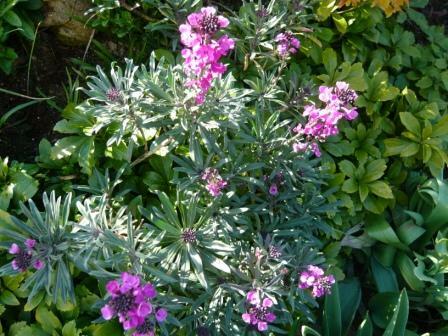 For cuttings I know it is the wrong time but I had a leggy Blackdown Sensation, which has large cerise blooms. I wanted to knock it into shape so I have taken various cuttings. I have got out my seed propogator for the seed sowing rush that will begin shortly but in the meantime I have put the pelargonium cuttings in the box. I will let you know my success rate but working on the basis all plants want to survive I remain hopeful. If all else fails I have the stock plant, all be it a lot shorter after its haircut. Dionysia are a group of plants containing 50+ species found in mountainous areas in Afghanistan and Iran. 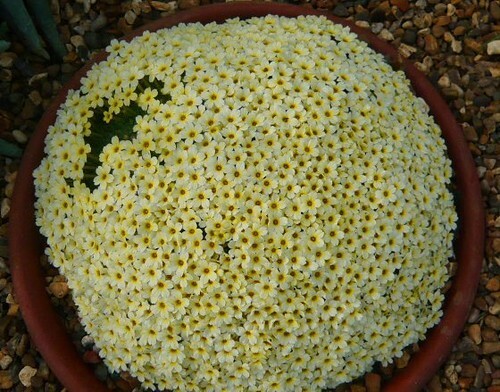 Dionysia are the ultimate alpine plant producing a mass of, often fragrant, bloom on top of a perfect dome. 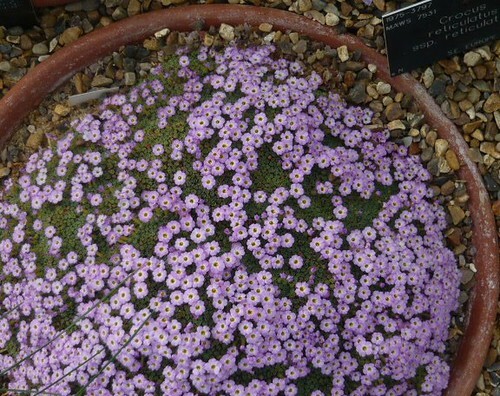 However they are tough to keep alive without alpine house conditions. These plants are not for the novice and need care particularly with watering. Dionysia are cousins of the cushion Androsaces but differ by having a long narrow tube to the corolla. They like a gritty scree with some humus and plenty of water in the growing season. 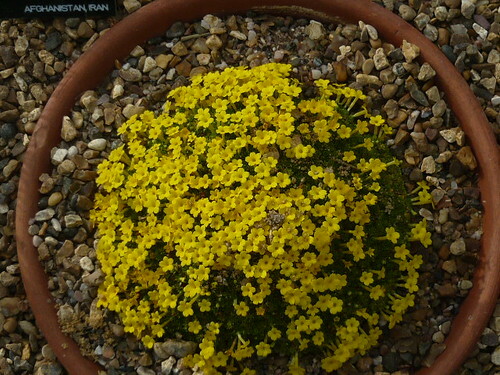 Dionysia are part of the Primulacea family and have many similar genes particularly when it comes to colour. 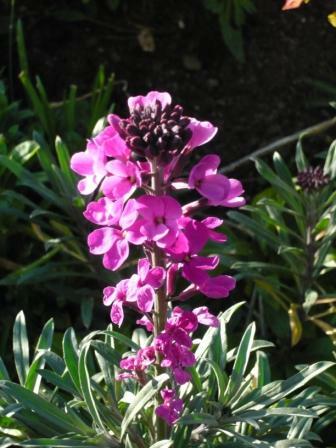 For example, hirsutin has been identified as the violet pigment in flowers of Dionysia archibaldii, D. bryoides, D. curviflora and D. microphylla. Yellow pigment in flowers of D. aretioides is now reported also in D. bornmuelleri and D. paradoxa. Download a pdf article on 5 new Dionysia species or visit Rock Garden database for a list of the Dionysia species.